Home›Casino Review›Slots Magic Casino Review – NO WAGERING FREE SPINS! Slots Magic Casino Review – Score 8.3! 1 Slots Magic Casino Review – Score 8.3! 2 100% Bonus Up To £50 + 15 WAGER FREE SPIN! I know, you actually despise online casino wagering requirements, right? Well despise no longer! Because this Slots Magic casino review gives you (After deposit) 25 FREE SPINS, with NO WAGERING! They do not stop there either, you will also get a healthy 100% deposit match! 100% Bonus Up To £50 + 15 WAGER FREE SPIN! 100% Deposit and 15 WAGER FREE SPINS! First of all, Slots Magic casino (formally known as Jackpot Party) is a well established online casino operated by Skill on Net. We mostly use these guys because of their vast selection of WMS slots and they also have a nice choice of Merkur slots too! Net|ENT, NextGen, Green Valley Games, Bally, Amaya, Microgaming, Barcrest, Realistic Gaming, Evolution, and also the aforementioned WMS and Merkur. Their customer support is excellent and the site is easy to navigate with the options of instant play or downloadable slots for your PC. Since they are part of the Skill on Net Casinos group, you can also receive the same bonuses and deals, there are a few to chose from!! They all have the same T’s & C’s too! Also, check our their tournaments! With Slots Magic casino you will get a 100% deposit match when you deposit, and also 15 FREE SPINS! Let’s not forget, the 15 free spins are also wager free! The minimum deposit to get this fantastic bonus is £20, up to a maximum of £50! Alternatively, if you sign up with the following bonus code: Y520 you will get FREE SPINS FOR A YEAR!!! In order to get this deal, you will need to make a deposit of £50 or more. 2) The weekly 10 free spins will be given either Thursdays or Fridays. The Free Spins must be played on the day of issue and expire in 24 hours. 3) Winnings from free spins given weekly are limited to a maximum amount of £100. 4) Free Spins given with a deposit must be played first. 5) Standard Bonus terms and conditions apply. You need to wager 30 x the bonus amount, before you can draw the winnings out. Bets placed in any game except Slots and Scratch games do not count towards the wagering requirements. All GVG Slots and Scratch bets count 100%, all other slots bets count 50%. This is how Slots Magic explain it in their terms, so let me break it down into layman terms for ya! If you play their GVG slots (I would sooner douche with hot sauce than play these slots), then it counts 100% towards wagering, play your favourite slots and they count 50% towards wagering which actually makes wagering 60 x the bonus amount. However, dont let this put you off, albeit a little challenging, it is well within reach of a cashout for the smaller deposits. On a regular basis (sometimes once a week) they offer us a 100% bonus for a deposit of £20, one good big win and you are almost there! They call it the Slots Magic Casino VIP lounge! As you level up by playing your favourite games you can receive free bonuses, promotion offers, deposit bonus offers and much more too. WARNING…we take our players” comfort seriously so prepare yourself for some serious pampering! Put your feet up, make yourself comfortable, relax and read on…. 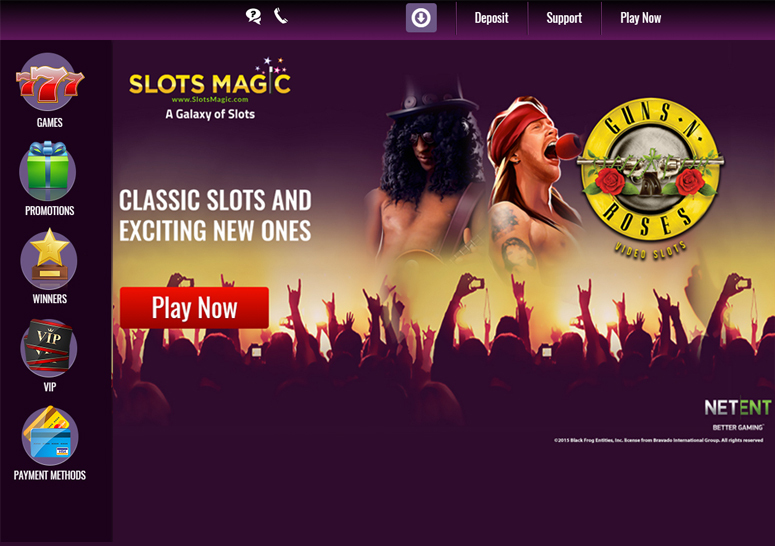 So we hope you love this Slots Magic casino review! 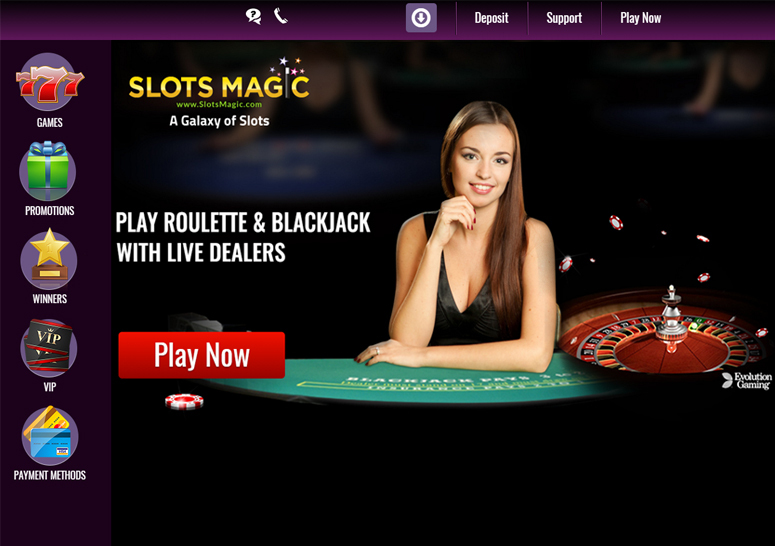 Slots Magic casino also have PlayOjo Casino as a sister site too! So make sure you check them out for the same excellent welcome bonus!